It has the perfect size that makes it hard to swallow for children. However, it's still advisable keep them out of reach of the children at all times. ➤ 4 Balls with "40mm" Diameter. Weight:11.7 oz. 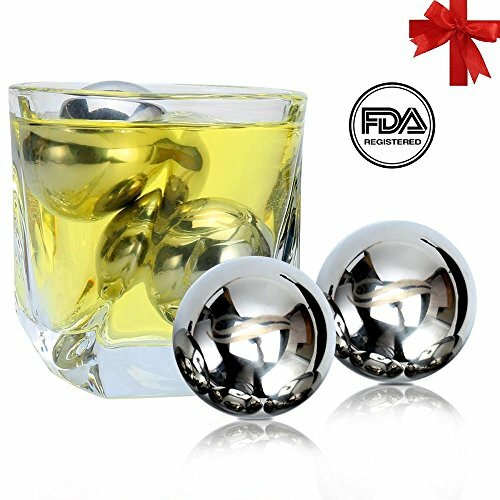 Material: FDA approved highest quality stainless steel. How does the Customer Service Departmentwork? If you are not 100% satisfied with the quality of the product, simplyreply to the shipping email that you will have received from us and letus know about the issue. We will assist you within one day. Click ADD TO CART on the top of this pageto chill your spirits & non-alcoholic beverages without dilution. ✔ LIQUID INSIDE. It provides 4 times better and longer cooling. The liquid inside helps to get chilled faster in the fridge, saving time before enjoying your drink. ✔ %100 STAINLESS STEEL. They are made of FDA approved highest quality stainless steel. ✔ PERFECTLY SIZED. It has the perfect size that makes it impossible to swallow. Unlike smaller ice cubes, it doesn't enter your mouth while taking sip. ✔ CLASSY VELVET BAG. They come with a velvet bag which makes it easy to carry, store and place in freezer. ✔ COOL WITHOUT DILUTION. Chill your pleasant taste without dilution. It won't melt in your spirits. If you have any questions about this product by Unique Solution, contact us by completing and submitting the form below. If you are looking for a specif part number, please include it with your message.